Remarks: Another round "10cm Wgr. 35 Nb TE" exists. Information is from captured documents. 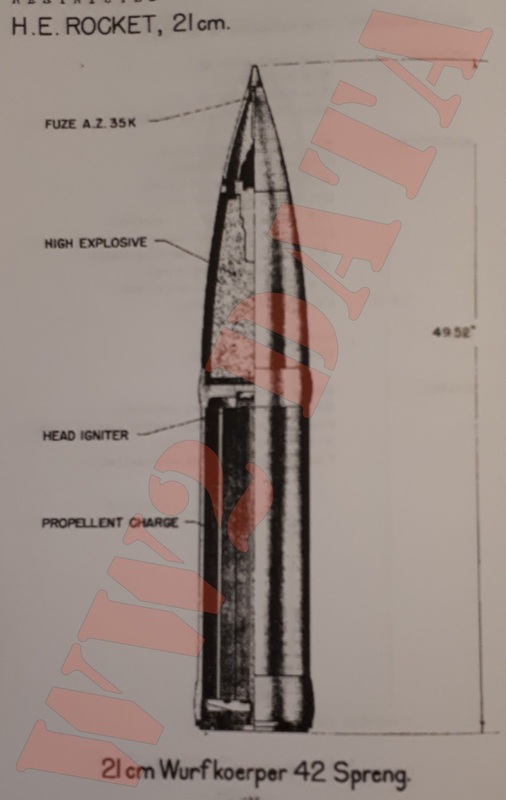 Remarks: A smoke shell exists. 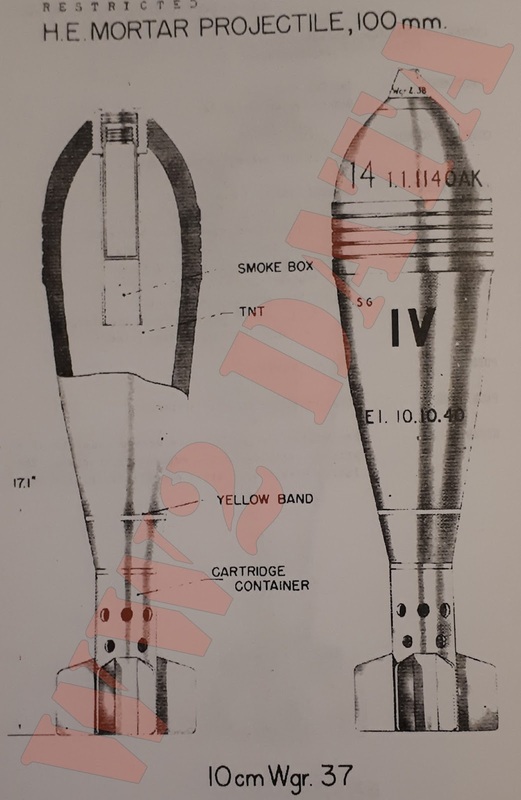 Remarks: A smoke bomb exists with the designation "38cm Wgr. 40 Nb." 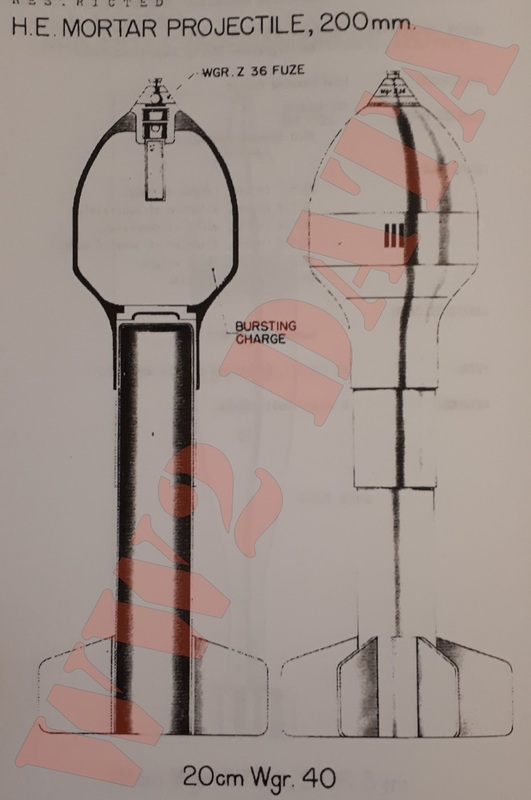 Type of bursting charge: Propaganda leaflets expelled by ejector C charge in flight. Fuze: Time (Air burst) - Black powder train burns from propellant to black powder expeller charge. 5. The base containing multiple venturis in two concentric annular rings. Venturis in center ring vent in line of propulsion, those in outer ring have rotating inclination. 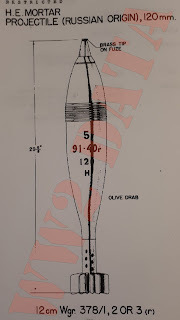 German Designation: 8.8cm R. Pz. B. Gr. 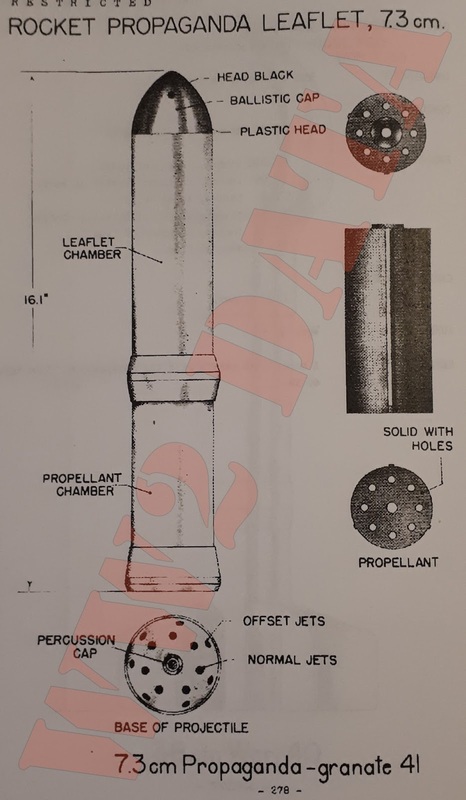 Type of propellant: Digl. R.P. 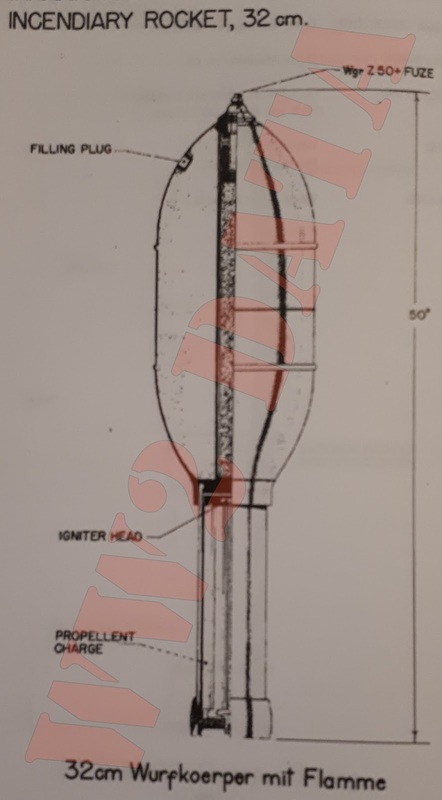 Remarks: Electric ignition similar to American launcher M1 and rocket H.E. 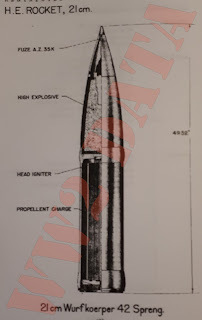 A.T. 2.36" M6A1. 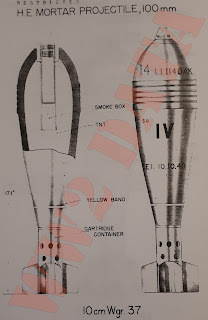 Rocket and launcher of heavier weight than American counterpart. Generates own electricity, no battery. 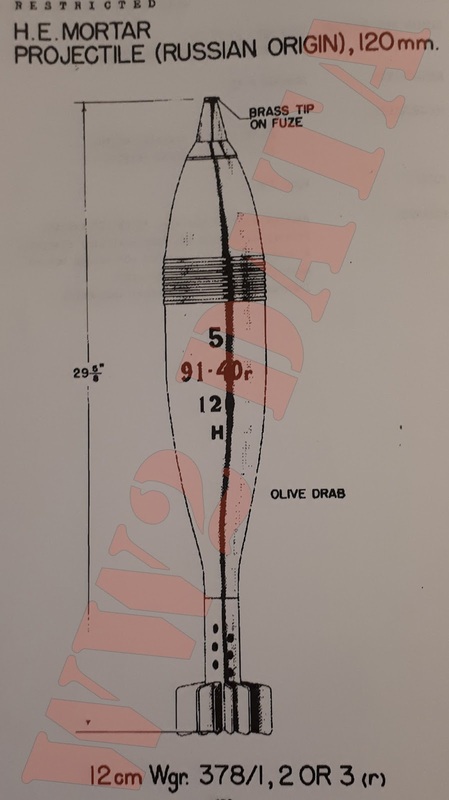 Fuze: Base graze fuze - DOV Zldg C/98 Np. Electric Fuze. Remarks: Range - 8,620 yards. Shell at rear of rocket container. Propellant vents through central venturi block. 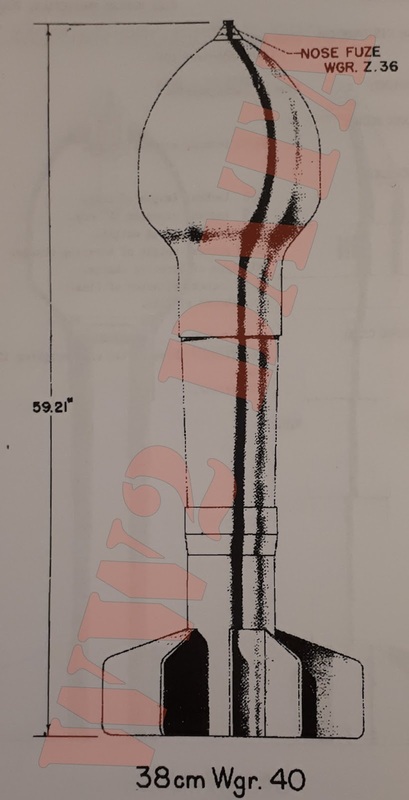 26 Venturi in annular ring of assembly which forms attachment between Body Tube and Burster Container. Can be filled with other chemicals. Fuze: Base graze fuze - DOV. 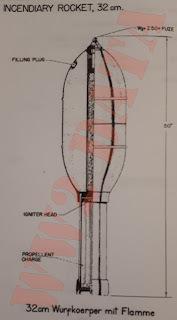 Electric Fuze - Erz 39. Propellant vents through central venturi block. 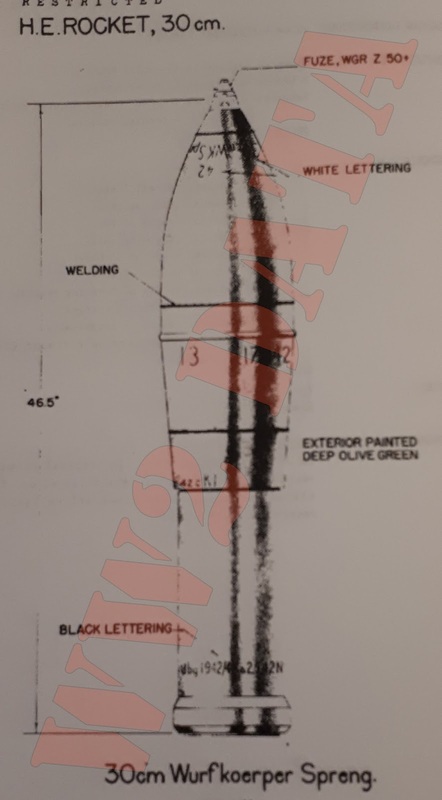 26 Venturi inclined at 140. 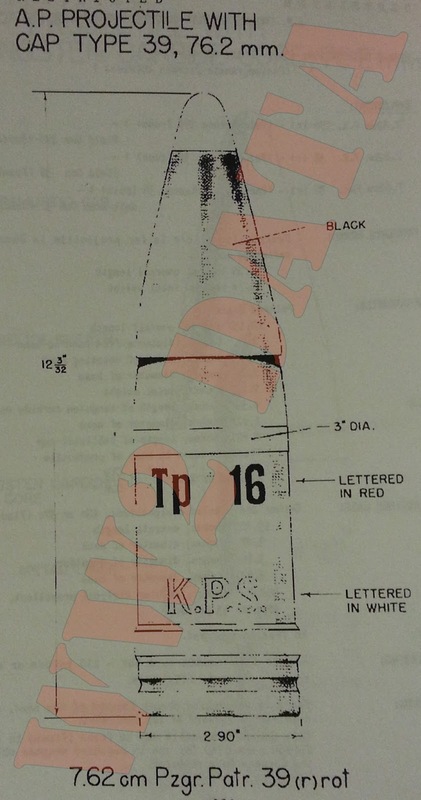 7 Uni-perforated sticks of propellant. 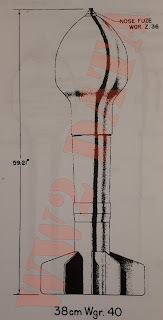 Venturi tubes offset 16 degrees, 22 in annular ring in base. Remarks: Range - 2,080 yards. 26 Jets in annular ring. In tropical round the venturis are sealed over by a soldered-on, flat, tinned iron ring which blows off on ignition; rotating inclination 14 degrees. Remarks: Range - 2,440 yards. Type of propellant: One stick, six celluloid tubes in slottings around its circumference, one containing quick match with G.P. pellet at each end in central hole. Remarks: Range - 2,430 yards. 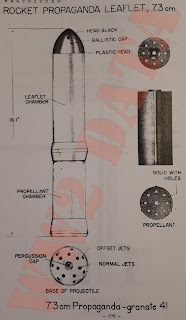 Single multi-perforated stick of propellant. 26 Venturi in annular ring at base, rotating inclination of 14 degrees.